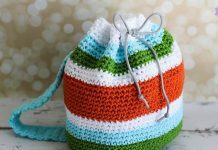 Watermelon Purse Crochet Free Pattern is designed to hold your coins, keys and any small objects. 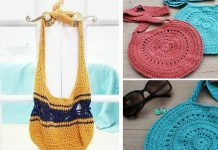 With a drawstring, it is easily to carry around or put inside your bag. The watermelon purse looks so cute and adorable, and will be a great gift to your family or friends. Meanwhile, the watermelon purse can organize your small stuffs well to make your bag tidy and clean. 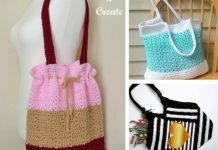 Thanks Fabiana Canu for sharing this free crocheting pattern on fabcroc.com. The link for the free pattern is provided below photo. Happy crocheting.